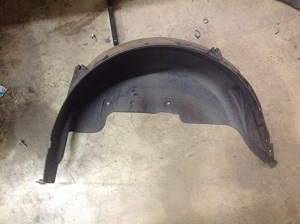 Used Rear Wheel Well Fender Liner for 2002-2006 R50 MINI Cooper, R53 Cooper S, and 2005-2008 R52 Cabrio. We removed these from one of the many wrecked MINIs we are parting out. These inner wheel wells are in good condition without holes worn through them. Sold as individual left and right or as a pair.